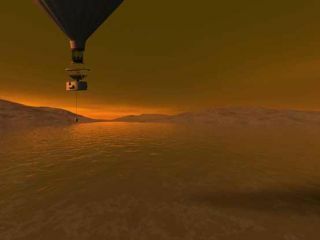 Artist's image depicting a hot air balloon on Titan, floating over a lake of liquid hydrocarbon. A hot air balloon drifts gently in the breeze, gliding over mountain ranges and vast lakes. Thick clouds extend over the entire horizon, threatening rain. The meager light that filters through illuminates one side of the balloon, making it look like a giant question mark in the sky. This is a vision that floats in the minds of scientists who study Titan, Saturn's largest moon. The Cassini spacecraft currently traveling around the Saturn system has provided us with our best glimpse yet of Titan, but there is still much to be explored. Athena Coustenis, an astrophysicist and planetologist with the Paris Observatory, is helping draft a plan to send a hot air balloon to Titan, as well as an orbiting spacecraft and a surface probe. Called TSSM – the Titan and Saturn System Mission – this three-tiered approach to exploration could shed more light on the still-mysterious moon. "Titan is the best place to go with a balloon because of the atmosphere," says Coustenis. Although the atmosphere of Titan is filled with a smoggy orange hydrocarbon haze, it is primarily composed of nitrogen – just like Earth's. In fact, Astrobiologists think Titan's atmosphere may be quite similar to how the Earth's was billions of years ago, before life on our planet generated oxygen. The moon's resemblance to Earth was eerily brought to mind when the Huygens probe descended to the surface of Titan in 2005. The photos showed a mountain with river channels carving their way down to a lake shoreline; a geography reminiscent of Earth today, except that on Titan the mountains are made of ice, and the rivers are liquid methane. The Huygens probe eventually landed in a sandy river bed dotted with pebbles. This soft terrain would prove hazardous for a wheeled rover – the Mars Rover Opportunity got stuck for weeks in a sand dune and was nearly stranded forever. "The ground on Titan may be gooey, and you don't want to get stuck somewhere," says Coustenis. She says that to move around, the TSSM probe could be outfitted with a helicopter rotor that would allow it to fly from place to place. The probe design also may include floaters that would prevent it from sinking if it landed on one of Titan's hydrocarbon lakes. The probe also would have a scoop to help it analyze the surface soil or liquid. The models for Titan suggest the surface would be primarily made of hydrocarbon particles that rained out of the thick atmosphere, but Coustenis says they are still unsure of exactly what the chemistry of Titan's surface is like. "Huygens was designed as a descent module, and there were no instruments designed to do surface science after landing," says Coustenis. "If you ask me what the dunes are made of, I don't know. The only way to find out what the surface is made of is to go touch it, sample it, and have a laboratory there that will analyze all the samples." Huygens unexpectedly did gain some data of the surface upon landing. The probe heated the cold surface and caused some of it to evaporate, and an instrument designed to read the chemistry of the atmosphere caught a whiff of methane gas. But Coustenis says that instrument only could detect a very limited spectrum, and so scientists still have more questions than answers about Titan's surface chemistry. Our knowledge of Titan's geography has improved thanks to Huygens and Cassini. Long before the probe landed, scientists thought Titan was completely covered by a hydrocarbon ocean. This ocean was thought to be the source of methane in Titan's atmosphere. The Huygens probe proved the theory of a global ocean was incorrect, and from what the Cassini spacecraft has seen so far, the lakes of liquid hydrocarbon on Titan are mostly confined to the moon's north polar region. Still, it's hard to speak of Titan's geography with much certainty. While Cassini's radar has allowed it to peer through Titan's thick atmospheric haze, in the end Cassini won't be able to map even half of the moon's surface. The third part of TSSM – an orbiting spacecraft – will give scientists a more complete view of the enigmatic moon. "We need a Titan-dedicated orbiter because after four years of Cassini, we still haven't mapped more than 25 percent of Titan's surface," says Coustenis. "When you see the diversity the moon has, you realize it needs full-coverage mapping. And we can have a polar orbiter, whereas Cassini only passes by Titan on the ecliptic." The orbiter also could be used to study Enceledus, a tiny moon that previously had not garnered much attention. Cassini discovered that Enceladus has geysers of liquid water at its south pole, and this spray generates one of the rings around Saturn. Scientists are puzzled how this icy snowball could generate enough heat to keep water liquid. Because liquid water is believed to be a prerequisite for life, some scientists now think Enceladus could be a potential location for alien organisms in our solar system. Some may think the TSSM is too risky a mission, since hot air balloons and probes that float on liquid have never before been sent to alien worlds. But Coustenis says our exploration efforts beyond Earth always need to be on the cutting edge. "Why would we want to have a new mission unless we were going to do something original with it?" she asks. "(This mission) is challenging, but it's do-able. Even if it is a crazy idea, we shouldn't keep sending the same kinds of missions out there." NASA and ESA are working in cooperation to develop an outer planets mission, and they are expected to choose between TSSM and a mission to Jupiter and its moon Europa in early 2009. Whichever mission they choose, the projected launch date is around 2020, with an arrival around 2030.